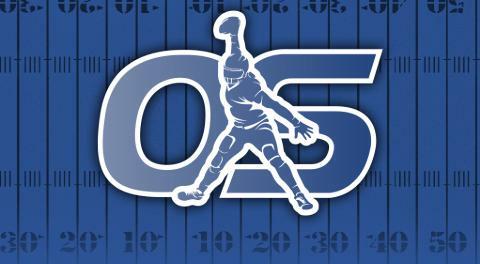 Our team at Optimum Scouting value all-star game practices substantially greater than some scouts, as it gives the opportunity to evaluate players under pressure, under the same conditions, and with all exigent factors eliminated. The Shrine Game practices are a very serious part of our process, and our staff has reviewed every player before this week’s practices. Instead of a full-blown preview and rankings, below are the 25 things I’m watching most closely at the 2019 East-West Shrine Game, including scouting notes, positional rankings, and injury/character insight on all of the top players. Two years ago, the Shrine Game switched from having a coaching staff consistently primarily of out-of-work but still motivated coaches as the staff for both rosters to being stocked with NFL assistant coaches. While none of the coaches in the game are likely to have decision making power like the Senior Bowl coaches will, they will get the unique access of seeing these players on a daily basis, in meetings, and get to know them on an intimate level. The Bucs have five coaches in the game (4 on the West staff, 1 on the East), Vikings have five coaches as well (3 on the West and 2 on the East), and the Redskins and Bills each have three coaches at the event. Those four teams will have a substantial leg up on evaluating the Shrine Game players’ character, work ethic, mental makeup, and more during practices. Despite being in Florida, the Shrine Game is known for brisk morning practices and windy conditions for quarterbacks. It’s always been a challenge (and a great test) for quarterbacks with limited arm talent to cut the wind and deliver strikes. Unfortunately (for just this aspect of evaluation, as I’m never mad to be indoors for practices), we won’t see that this year, as all of the practices are being played at Tropicana field. Perfect conditions, ideal field, and no excuses for all of the top players, especially the quarterbacks. 3. Easton Stick: Next Jimmy Garoppolo? Five years ago, Eastern Illinois’ Jimmy Garoppolo attended the East-West Shrine Game, already crowed by yours truly as the best Shrine Game quarterback in well over a decade and poised to earn a first-round grade. He dominated during the week of practice and later earned a Senior Bowl call-up, en route to a second round draft select. 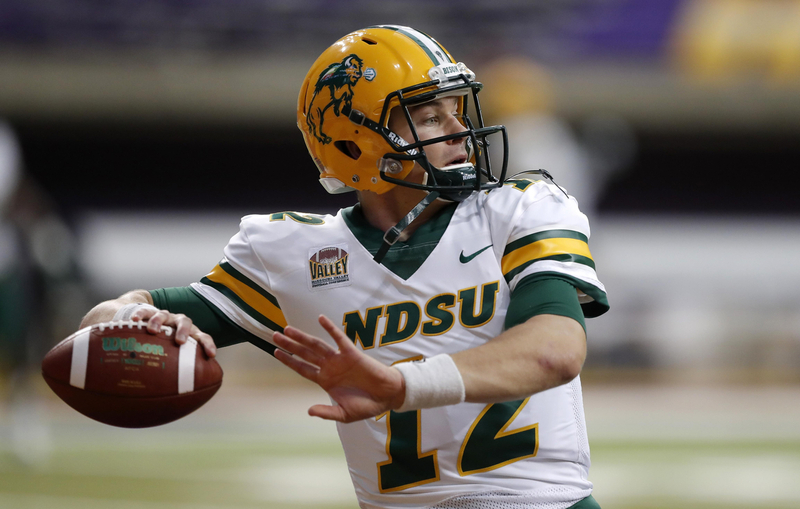 This year, North Dakota State’s Easton Stick is clearly the best quarterback in attendance. With composed feet, strong athletic movement and upside, a natural throwing release and motion, and decisiveness in his downfield targets, he has all the tools to be a future NFL starter with time. He’s no Jimmy Garoppolo, but he carries a higher grade from us than more than a few Senior Bowl quarterbacks. A dominating week here could put him in the top-3 round position for NFL teams. With three future NFL offensive linemen and three future NFL receivers at his disposal, Jordan Ta’amu had plenty of support at Ole Miss this year. A natural thrower whose plus agility and composure allow for maximum escape-ability, Ta’amu showed the creativity as a quarterback NFL teams covet in Day 3, likely NFL backup passers. But his arm strength and decisiveness questions persistent on film, especially against top competition (and especially vs. Alabama). Showing that he can drive with high velocity on downfield mid-field routes and can be decisive in 7-on-7 and team drills will be highly important for Ta’amu to secure a draft pick. 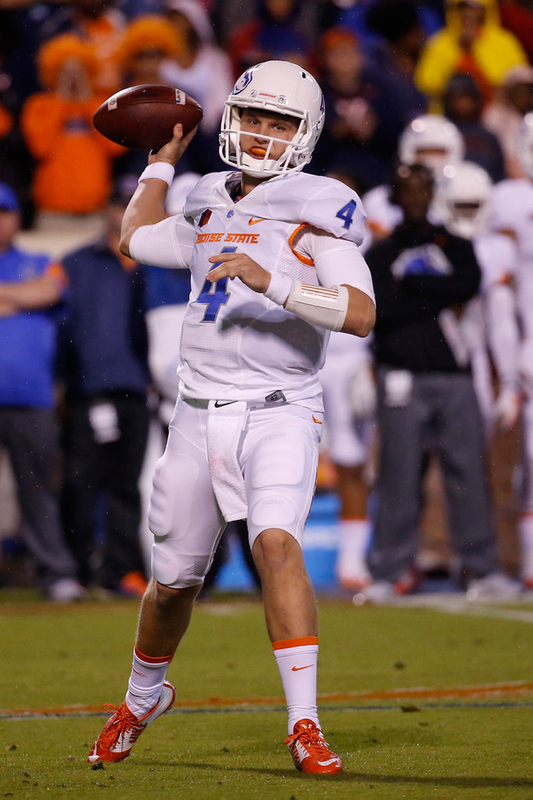 Hyperbole incoming: Brett Rypien’s release and composed lower half look like Tom Brady’s. He has a smooth release, effortless motion, and it shows in his confident, accurate placement in tight windows, especially in the mid-field. Running a pro-style offense (a rarity for a productive college quarterback), Rypien is already prepared for the NFL from a scheme/mental makeup perspective. He does have issues with his timing and internal clock, and doesn’t have high-end placement on the perimeter, but is accurate, throws catchable balls, and isn’t rattled by pressure. I wouldn’t be surprised if more than few teams value him as a future NFL starter in their system. NFL teams have always put a high priority on running backs who can pass block early in their NFL careers and have the toughness and physicality to be redzone/short area running backs. But, they’ve also recently put a high preference on top-end speed for non-first and second round running backs. Brossette is maybe the best pass blocking running back in the 2018 draft class, and those at LSU say he might be the toughest running back the program has had in recent years. But he’s slow, and might run in the mid to high 4.6s. I’d still take him over other running backs here, but showing that he can separate and finish big runs, especially in the Shrine Game itself, will be important to securing a draft pick. Here’s our rankings of the top-6 running backs in attendee at the Shrine Game. Pittsburgh’s Qadree Ollison, who is injured and will not be participating, would have been our #1 running back. 8. Can One Year Breakout Receiver Jamal Custis Rise to a Top-100 Pick? In 2017, Syracuse receiver Jamal Custis had just eight receptions. In 2018, he posted 51 catches and emerged as one of the best vertical receivers in the country. A quick transition from rotational receiver to a key part of Syracuse’s surprising emergence as one of the best teams in the ACC, Custis has the length and fluidity on the perimeter to continue to vault himself higher for NFL teams with a strong draft process. For breakout seniors/one year wonder juniors, the draft process, led by the All-Star Games, is highly important for evaluations. Custis, who has some top-end speed concerns, ahs a chance to answer those questions and emerge as the best receiver of the a strong group here in St. Pete. 9. Why is DeMarkus Lodge Here at the Shrine Game? Easily the best receiver at the Shrine Game, Lodge entered the season with many top-three round grades from NFL teams and Optimum Scouting. But with two other standout and future top-two round receivers on the offense and Lodge’s inconsistency in his apex route separation, he’s slipped into more of the Day 3 consideration. 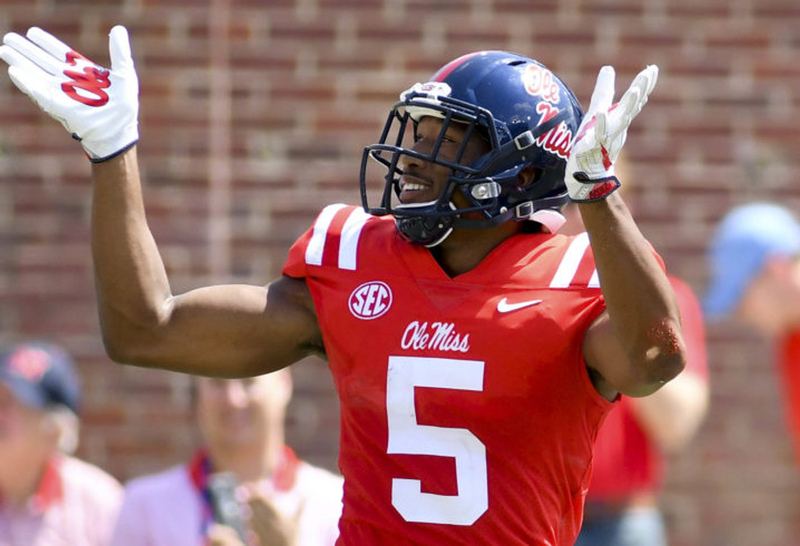 He’s highly physical as a blocker, runner and in getting free as a route runner, and gets to his top speed quickly for a longer receiver, all of which could make him a force in practices and remind NFL evaluators why he had such high preseason grades. Three straight years of over 60 catches and over 100 targets should be enough to evaluate a receiver prospect like KeeSean Johnson. Johnson finished the 2018 season with nearly 100 catches and has one of the best deep speed for a 6’1+ receive and catch radius of any receiver in this class. But his route definition and separation in the short area is still surprisingly raw, likely due to his offense’s limitations in his route tree and focuses during practice. Showing NFL teams he can win in short area route separation, being decisive in his breaks, and running crisp inside and dig routes will go a long way in pushing him into the top-four rounds like his talent flashes indicate he could. After starting five games at both guard and tackle his redshirt freshman season, Tyler Jones has played over 98% of his teams’ snaps in his college career at left tackle. 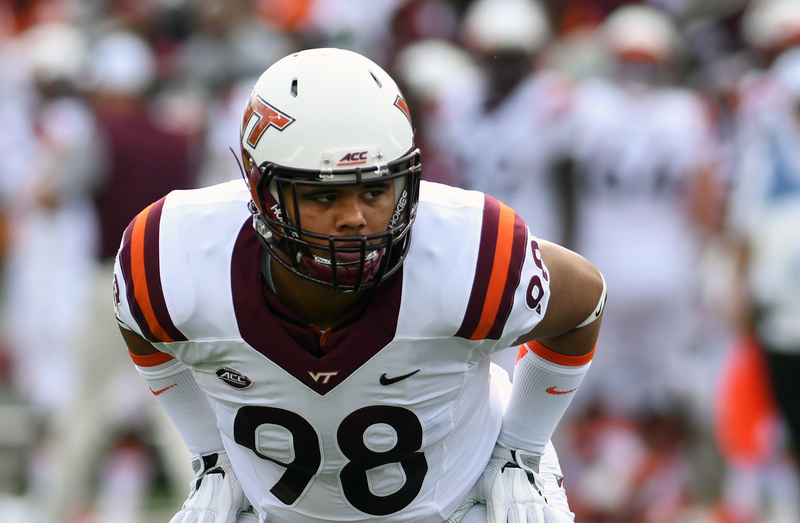 He was among the country’s most efficient and effective left tackles despite playing in an ACC conference loaded with NFL pass rushers and being under 6’4. His experience, reliability, and lateral movement control makes him easily the offensive lineman at the Shrine Game I’d want most on my team, and he has a chance to be a quietly dominating force here. Despite the defensive line talent here, he might only lose a handful of practice reps this week. Juwann Bushell-Beatty is 6’5, a former four-star recruit, and started over 25 games at right tackle for one of the biggest NFL offensive line factories in the country in the Michigan Wolverines. While his speed and wide-ranging athleticism may be a concern for NFL teams (along with his late-season injury woes), his evaluation is fairly easy for NFL teams. With those above benchmarks of future NFL success along with more than few highly impressive games (see Notre Dame), Bushell-Beatty should be a fairly easy evaluation as a Day 3 draft pick, and one that could be a starter at guard or tackle in the NFL before the 2019 season is over. Along with should-be Senior Bowl invite Tyler Jones, the top-six should all be on the Senior Bowl shortlist if there’s an injury. Pope, Bushell-Beatty, St. Louis and Skule can all offer value at multiple positions in the NFL and if they started games in 2019 I wouldn’t be surprised. A former Texas transfer who left the program in 2016, Derick Roberson has been highly productive at the FCS level and has been one of the best pass rushers at the small school level the last two seasons. But injury and character concerns carry baggage for Roberson for NFL teams, and weighing production and impressive film vs. character concerns is a tough task for a small school evaluation. Roberson can show NFL teams his maturity and work ethic that coaches at Sam Houston State speak about, and that starts at the Shrine Game. Both Virginia Tech’s Ricky Walker and Temple’s Michael Dogbe are under 300 pounds and likely below 6’2 feet tall. Undersized defensive tackles have been a market inefficiency in recent draft classes, with Aaron Donald, Grady Jarrett and many more sliding until late in the draft only to make an impact as rookies. Walker flirts with the “undersized” label, but his consistently quick hands and effective bend to take advantage of poor positioning/placement by blockers makes him a high-end penetrating three-technique. Michael Dogbe, on the other hand, is far less consistent with his hands and placement, and his still raw playing style is a risk that NFL teams may not want to take unless he can highly impress at the Shrine Game and test well at the NFL Combine. Kansas football is back! Not quite, but linebacker Jon Dineen is a fluid, explosive and aggressive (sometimes too aggressive) linebacker. If he can be effective in running back/tight end coverage, he might be a mid-Day 3 pick. His teammate, Daniel Wise, has some long-term injury concerns that NFL teams will look to check up on, but talent-wise, he has clear mid-round value as a long, versatile defensive lineman. Ricky Walker hasn’t put up the production like his film says he could have, and he might be in store for a far more productive NFL career than a college one. Both Daylon Mack and Landis Durham highly impressed on pre-Shrine Game film review. Durham is raw and makes some missteps and clear mistakes in pressure, but has the most upside of any pass rusher in attendance. One of the best off-ball linebackers our staff evaluated all season, Khalil Hodge is a favorite of many in the industry. Being at the Shrine Game is a bit of a surprise, but it shows how linebackers without elite coverage or pass rush ability are valued by NFL teams now. Scouts that have gone through Buffalo or have seen Hodge on the road are consistently impressed, and he’s about as safe of a 4thround pick as there is. Mississsippi State’s Jamal Peters was not impressive on film this year. He entered the year with a top-100 grade from Optimum Scouting, and did not look like that throughout the season. But he still might get drafted in the top-100. At 6’2, 210+ and with plus movement ability, talents like Peters are just too hard to find. If he can impress at the Shrine Game, which I believe he will, he has a great chance to be the top player drafted from the Shrine Game. In games studied, Blace Brown played the most true Cover 2 defense reps of any defensive back evaluated this year. At just under 6’0 and less than 200 pounds, he’ll need to show more versatility away from that defense unless he plans on bulking up a bit, as his margin for error as a mid-field and short-area cornerback is slight. He’s a physical finishing tackler and ha great timing and ball skills in the short area, but he needs to show NFL teams he can turn and run vertically at the Shrine Game. One of my personal favorite plyers coming into the year, Randall has tremendously high praise from the Temple football staff with his work ethic and leadership ability in their locker room. 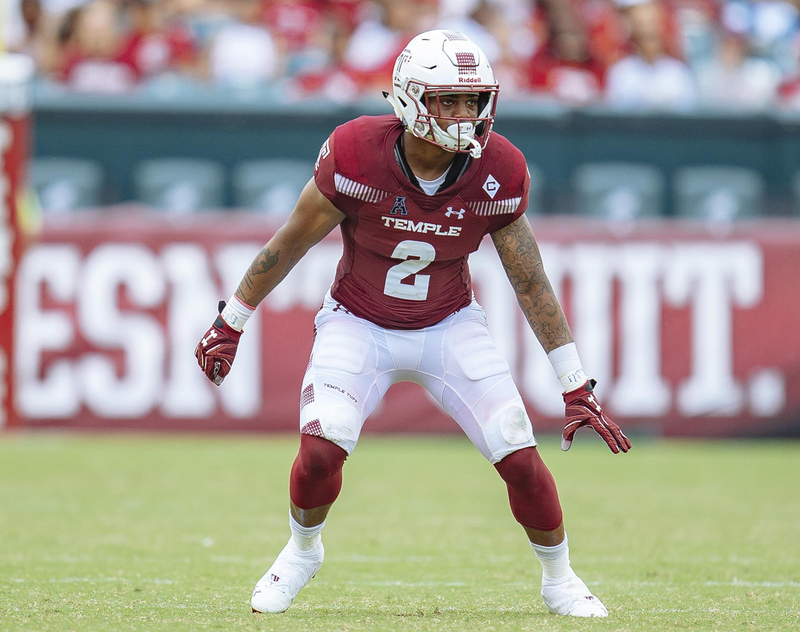 Smart, tough, physical and versatile, Randall didn’t emerge as a star for Temple this year, but his bend, quickness to the perimeter and ball skills (especially showed in his junior year) all speak to an NFL starter. The Senior Bowl roster is loaded with top-4 round draft picks at safety, and while Randall may also land in that same region of the draft. Showing that leadership ability during the week along with versatility at safety will be key. Prediction: An East Team coach’s NFL franchise is the one that drafts him in the top-five rounds. Surprisingly, Lukas Denis’s teammate safety Will Harris emerged as the better NFL prospect this year, but Denis offers high-end versatility and confidence in coverage and as a tackler at every spot. Denis has played both safety alignments and in the nickel, the later of which is the most intriguing part of his evaluate. Look for Denis to get some work in the nickel during practices at the Shrine Game and, if he impresses there, he’s a strong NFL Combine away from being one of many Boston College top-four round draft picks. All of the defensive backs are grouped together, but with four of the first five listed as cornerback, it’s clear that it’s a strength of this roster. I’d expect safety Lukas Denis to get some nickel cornerback work and safety Chris Johnson to get some perimeter cornerback work. It’s shocking, but if you go back in Shrine Game history, the perceived “second best college all-star game” runs laps around the Senior Bowl in specialist evaluation. This year, they’ve done it again. Per Optimum Scouting’s kicker analytics, Matt Gay of Utah is the best kicking prospect for the 2019 NFL Draft, and John Barron of San Diego State is the third. Both are projected to be above average kickers in the NFL and Gay is a highly likely draft pick.